__ How to add your printer model to WIC supported printers list? 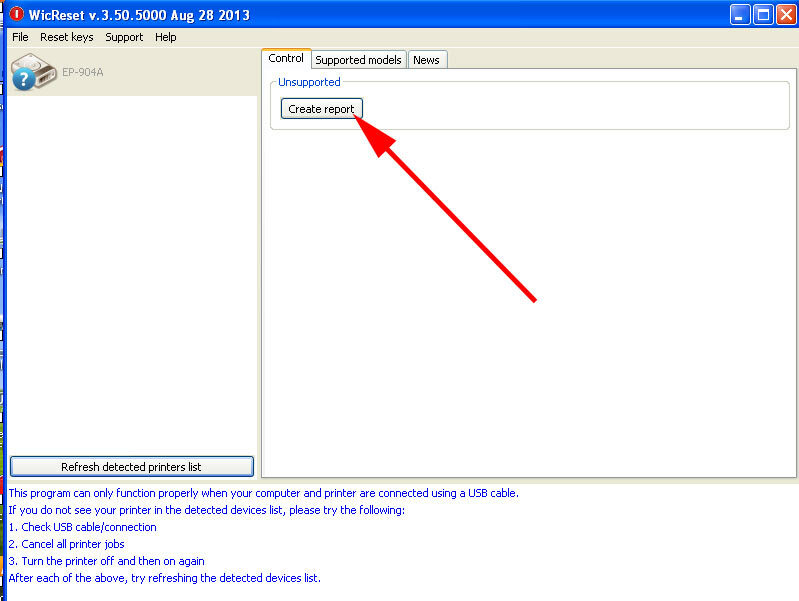 If you have the printer not supported by WIC Reset Utility you can try to help us to add your printer model. Connect the Epson printer to PC by proper USB cable and Run the WIC Reset Utility. If Your printer model is not supported yet - You'll see Symbol "?" at the printer model. See the picture in the left window. Click on the Create a report button. The WIC Reset Utility will create the report and save it at the WIC server. We'll Check this information and add this model to supported list if it is possible. This is very easy. If you have any questions - you are welcome here! sir? how can i add printer model C45?? is it available or not? Click Create Report button and send us the log file. We'll check if we can add this model. This model will NOT be supported. But, on V3.01 there is a 'Create report' option which I ran, does it automatically send the report to you or where is it stored...? how many numbers do the serial key has? I used T13 and I use Wic v 2.22.000 to make chipless. Can you add EP-306 to WIC ? I couldn't create a report. I bought a key, then realized the epson stylus pro 3800 isn't supported. Suggestions? DO you think you all will get the reset for that? I realize it only reads the counters now. Could you please add the Epson Workforce Pro WP 4025 to your list? Non-original ink doesn't work with it. This would be superb! WP4025 is supported by WIC Utility. You can Read waste ink counters and make Firmware downgrade. You CANT reset waste ink counters. hi the epson dx4450 isn't still supported from the program? Are there any plans to support Epson L486 for inkpad counter reset please? Please include WF3010, WF7015, WF7525 into the WIC Chipless list. Thank you very much! New model Epson WF7710 (replaces WF7110), will this printer be supported? It use the same carts as the WF7110.